Chichen Itza[nb 1] was a large pre-Columbian city built by the Maya people of the Terminal Classic period. The archaeological site is located in Tinúm Municipality, Yucatán State, Mexico. The Maya name "Chichen Itza" means "At the mouth of the well of the Itza." This derives from chi', meaning "mouth" or "edge," and chʼen or chʼeʼen, meaning "well." Itzá is the name of an ethnic-lineage group that gained political and economic dominance of the northern peninsula. One possible translation for Itza is "enchanter (or enchantment) of the water," from its, "sorcerer," and ha, "water." The name is spelled Chichén Itzá in Spanish, and the accents are sometimes maintained in other languages to show that both parts of the name are stressed on their final syllable. Other references prefer the Maya orthography, Chichen Itzaʼ (pronounced [tʃitʃʼen itsáʔ]). This form preserves the phonemic distinction between chʼ and ch, since the base word chʼeʼen (which, however, is not stressed in Maya) begins with a postalveolar ejective affricate consonant. The word "Itzaʼ" has a high tone on the "a" followed by a glottal stop (indicated by the apostrophe). Evidence in the Chilam Balam books indicates another, earlier name for this city prior to the arrival of the Itza hegemony in northern Yucatán. While most sources agree the first word means seven, there is considerable debate as to the correct translation of the rest. This earlier name is difficult to define because of the absence of a single standard of orthography, but it is represented variously as Uuc Yabnal ("Seven Great House"), Uuc Hab Nal ("Seven Bushy Places"), Uucyabnal ("Seven Great Rulers") or Uc Abnal ("Seven Lines of Abnal"). [nb 3] This name, dating to the Late Classic Period, is recorded both in the book of Chilam Balam de Chumayel and in hieroglyphic texts in the ruins. Chichen Itza is located in the eastern portion of Yucatán state in Mexico. The northern Yucatán Peninsula is arid, and the rivers in the interior all run underground. There are four visible, natural sink holes, called cenotes, that could have provided plentiful water year round at Chichen, making it attractive for settlement. Of these cenotes, the "Cenote Sagrado" or Sacred Cenote (also variously known as the Sacred Well or Well of Sacrifice), is the most famous. In 2015, scientists determined that there is a hidden cenote under Kukulkan, which has never been seen by archaeologists. The Jaguar Throne inside the "El Castillo" (Temple of Kukulcan) pyramid. While there is some archaeological evidence that indicates Chichén Itzá was at one time looted and sacked, there appears to be greater evidence that it could not have been by Mayapan, at least not when Chichén Itzá was an active urban center. Archaeological data now indicates that Chichen Itza declined as a regional center by 1250, before the rise of Mayapan. [nb 4][not in citation given (See discussion.)] Ongoing research at the site of Mayapan may help resolve this chronological conundrum. After Chichén Itzá elite activities ceased, the city may not have been abandoned. When the Spanish arrived, they found a thriving local population, although it is not clear from Spanish sources if these Maya were living in Chichen Itza proper, or a nearby settlement. The relatively high population density in the region was a factor in the conquistadors' decision to locate a capital there. According to post-Conquest sources, both Spanish and Maya, the Cenote Sagrado remained a place of pilgrimage. In 1526 Spanish Conquistador Francisco de Montejo (a veteran of the Grijalva and Cortés expeditions) successfully petitioned the King of Spain for a charter to conquer Yucatán. His first campaign in 1527, which covered much of the Yucatán Peninsula, decimated his forces but ended with the establishment of a small fort at Xaman Haʼ, south of what is today Cancún. Montejo returned to Yucatán in 1531 with reinforcements and established his main base at Campeche on the west coast. He sent his son, Francisco Montejo The Younger, in late 1532 to conquer the interior of the Yucatán Peninsula from the north. The objective from the beginning was to go to Chichén Itzá and establish a capital. In 1923, the Mexican government awarded the Carnegie Institution a 10-year permit (later extended another 10 years) to allow U.S. archaeologists to conduct extensive excavation and restoration of Chichen Itza. Carnegie researchers excavated and restored the Temple of Warriors and the Caracol, among other major buildings. At the same time, the Mexican government excavated and restored El Castillo (Temple of Kukulcan) and the Great Ball Court. There have been two later expeditions to recover artifacts from the Cenote Sagrado, in 1961 and 1967. The first was sponsored by the National Geographic, and the second by private interests. Both projects were supervised by Mexico's National Institute of Anthropology and History (INAH). INAH has conducted an ongoing effort to excavate and restore other monuments in the archaeological zone, including the Osario, Akab Dzib, and several buildings in Chichén Viejo (Old Chichen). The site contains many fine stone buildings in various states of preservation, and many have been restored. The buildings were connected by a dense network of paved causeways, called sacbeob. [nb 5] Archaeologists have identified over 80 sacbeob criss-crossing the site, and extending in all directions from the city. Many of these stone buildings were originally painted in red, green, blue and purple colors. Pigments were chosen according to what was most easily available in the area. The site must be imagined as a colorful one, not like it is today. Just like gothic cathedrals in Europe, colors provided a greater sense of completeness and contributed greatly to the symbolic impact of the buildings. 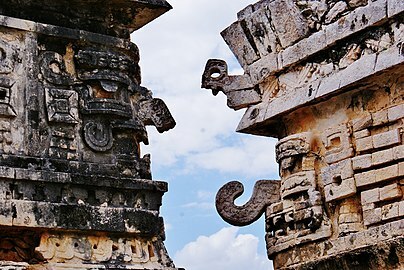 The architecture encompasses a number of styles, including the Puuc and Chenes styles of the northern Yucatán Peninsula. The buildings of Chichen Itza are grouped in a series of architectonic sets, and each set was at one time separated from the other by a series of low walls. The three best known of these complexes are the Great North Platform, which includes the monuments of El Castillo (Temple of Kukulcan), Temple of Warriors and the Great Ball Court; The Osario Group, which includes the pyramid of the same name as well as the Temple of Xtoloc; and the Central Group, which includes the Caracol, Las Monjas, and Akab Dzib. The serpent effect demonstrated during the night show with artificial lighting. The serpent effect observed during the 2009 spring equinox. Dominating the North Platform of Chichen Itza is the Temple of Kukulkan (a Maya feathered serpent deity similar to the Aztec Quetzalcoatl). The temple is usually referred to as El Castillo ("the castle"), as it was so named by first Spaniards in the area. This step pyramid stands about 30 metres (98 ft) high and consists of a series of nine square terraces, each approximately 2.57 metres (8.4 ft) high, with a 6-metre (20 ft) high temple upon the summit. Mesoamerican cultures periodically superimposed larger structures over older ones, and the Temple of Kukulcan is one such example. In the mid-1930s, the Mexican government sponsored an excavation of the temple. After several false starts, they discovered a staircase under the north side of the pyramid. By digging from the top, they found another temple buried below the current one. 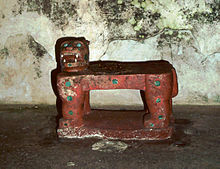 Inside the temple chamber was a Chac Mool statue and a throne in the shape of Jaguar, painted red and with spots made of inlaid jade. The Mexican government excavated a tunnel from the base of the north staircase, up the earlier pyramid's stairway to the hidden temple, and opened it to tourists. In 2006, INAH closed the throne room to the public. Around the Spring and Autumn equinoxes, in the late afternoon, the northwest corner of the pyramid casts a series of triangular shadows against the western balustrade on the north side that evokes the appearance of a serpent wriggling down the staircase, which some scholars have suggested is a representation of the feathered-serpent god Kukulcan. It is a widespread belief that this light-and-shadow effect was achieved on purpose to record the equinoxes, but the idea is highly unlikely: it has been shown that the phenomenon can be observed, without major changes, during several weeks around the equinoxes, making impossible to determine any date by observing this effect alone. The Temple of the Tables is the northernmost of a series of buildings to the east of El Castillo. Its name comes from a series of altars at the top of the structure that are supported by small carved figures of men with upraised arms, called "atlantes." Sacbe Number One is a causeway that leads to the Cenote Sagrado, is the largest and most elaborate at Chichen Itza. This "white road" is 270 metres (890 ft) long with an average width of 9 metres (30 ft). It begins at a low wall a few metres from the Platform of Venus. According to archaeologists there once was an extensive building with columns at the beginning of the road. The Temple of the Warriors complex consists of a large stepped pyramid fronted and flanked by rows of carved columns depicting warriors. This complex is analogous to Temple B at the Toltec capital of Tula, and indicates some form of cultural contact between the two regions. The one at Chichen Itza, however, was constructed on a larger scale. At the top of the stairway on the pyramid's summit (and leading towards the entrance of the pyramid's temple) is a Chac Mool. A section of the upper façade with a motif of x's and o's is displayed in front of the structure. The Temple of the Small Tables which is an unrestored mound. And the Thompson's Temple (referred to in some sources as Palace of Ahau Balam Kauil ), a small building with two levels that has friezes depicting Jaguars (balam in Maya) as well as glyphs of the Maya god Kahuil. The Osario itself, like El Castillo, is a step-pyramid temple dominating its platform, only on a smaller scale. Like its larger neighbor, it has four sides with staircases on each side. There is a temple on top, but unlike El Castillo, at the center is an opening into the pyramid which leads to a natural cave 12 metres (39 ft) below. Edward H. Thompson excavated this cave in the late 19th century, and because he found several skeletons and artifacts such as jade beads, he named the structure The High Priests' Temple. Archaeologists today believe neither that the structure was a tomb nor that the personages buried in it were priests. The Temple of Xtoloc is a recently restored temple outside the Osario Platform is. It overlooks the other large cenote at Chichen Itza, named after the Maya word for iguana, "Xtoloc." The temple contains a series of pilasters carved with images of people, as well as representations of plants, birds and mythological scenes. The Casa Colorada (Spanish for "Red House") is one of the best preserved buildings at Chichen Itza. Its Maya name is Chichanchob, which according to INAH may mean "small holes". In one chamber there are extensive carved hieroglyphs that mention rulers of Chichen Itza and possibly of the nearby city of Ek Balam, and contain a Maya date inscribed which correlates to 869 AD, one of the oldest such dates found in all of Chichen Itza. While the Casa Colorada is in a good state of preservation, other buildings in the group, with one exception, are decrepit mounds. One building is half standing, named La Casa del Venado (House of the Deer). This building's name has been long used by the local Maya, and some authors mention that it was named after a deer painting over stucco that doesn't exist anymore. Las Monjas is one of the more notable structures at Chichen Itza. It is a complex of Terminal Classic buildings constructed in the Puuc architectural style. The Spanish named this complex Las Monjas ("The Nuns" or "The Nunnery") but it was actually a governmental palace. Just to the east is a small temple (known as the La Iglesia, "The Church") decorated with elaborate masks. The Las Monjas group is distinguished by its concentration of hieroglyphic texts dating to the Late to Terminal Classic. These texts frequently mention a ruler by the name of Kʼakʼupakal. El Caracol ("The Snail") is located to the north of Las Monjas. It is a round building on a large square platform. It gets its name from the stone spiral staircase inside. 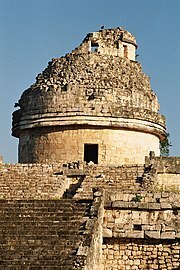 The structure, with its unusual placement on the platform and its round shape (the others are rectangular, in keeping with Maya practice), is theorized to have been a proto-observatory with doors and windows aligned to astronomical events, specifically around the path of Venus as it traverses the heavens. Akab Dzib is located to the east of the Caracol. The name means, in Yucatec Mayan, "Dark Writing"; "dark" in the sense of "mysterious". 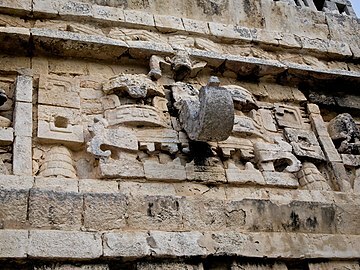 An earlier name of the building, according to a translation of glyphs in the Casa Colorada, is Wa(k)wak Puh Ak Na, "the flat house with the excessive number of chambers," and it was the home of the administrator of Chichén Itzá, kokom Yahawal Choʼ Kʼakʼ. The southern end of the building has one entrance. The door opens into a small chamber and on the opposite wall is another doorway, above which on the lintel are intricately carved glyphs—the "mysterious" or "obscure" writing that gives the building its name today. Under the lintel in the doorjamb is another carved panel of a seated figure surrounded by more glyphs. Inside one of the chambers, near the ceiling, is a painted hand print. Approximately 4 km (2.5 mi) south east of the Chichen Itza archaeological zone are a network of sacred caves known as Balankanche (Spanish: Gruta de Balankanche), Balamkaʼancheʼ in Yucatec Maya). In the caves, a large selection of ancient pottery and idols may be seen still in the positions where they were left in pre-Columbian times. A photo of Chichen Itza in 1859–1860 by Désiré Charnay before vegetation was removed. Chichen Itza is one of the most visited archaeological sites in Mexico; in 2017 it was estimated to have received 2.1 million visitors. Tourism has been a factor at Chichen Itza for more than a century. John Lloyd Stephens, who popularized the Maya Yucatán in the public's imagination with his book Incidents of Travel in Yucatan, inspired many to make a pilgrimage to Chichén Itzá. Even before the book was published, Benjamin Norman and Baron Emanuel von Friedrichsthal traveled to Chichen after meeting Stephens, and both published the results of what they found. Friedrichsthal was the first to photograph Chichen Itza, using the recently invented daguerreotype. Gomez Rul's son-in-law, Fernando Barbachano Peon (a grandnephew of former Yucatán Governor Miguel Barbachano), started Yucatán's first official tourism business in the early 1920s. He began by meeting passengers who arrived by steamship at Progreso, the port north of Mérida, and persuading them to spend a week in Yucatán, after which they would catch the next steamship to their next destination. In his first year Barbachano Peon reportedly was only able to convince seven passengers to leave the ship and join him on a tour. In the mid-1920s Barbachano Peon persuaded Edward Thompson to sell 5 acres (20,000 m2) next to Chichen for a hotel. In 1930, the Mayaland Hotel opened, just north of the Hacienda Chichén, which had been taken over by the Carnegie Institution. In 1972, Mexico enacted the Ley Federal Sobre Monumentos y Zonas Arqueológicas, Artísticas e Históricas (Federal Law over Monuments and Archeological, Artistic and Historic Sites) that put all the nation's pre-Columbian monuments, including those at Chichen Itza, under federal ownership. There were now hundreds, if not thousands, of visitors every year to Chichen Itza, and more were expected with the development of the Cancún resort area to the east. In the 1980s, Chichen Itza began to receive an influx of visitors on the day of the spring equinox. Today several thousand show up to see the light-and-shadow effect on the Temple of Kukulcan in which the feathered serpent god appears to crawl down the side of the pyramid. [nb 7] Tour guides will also demonstrate a unique the acoustical effect at Chichen Itza: a handclap before the in front of the staircase the El Castillo pyramid will produce by an echo that resembles the chirp of a bird, similar to that of the quetzal as investigated by Declercq. Chichen Itza, a UNESCO World Heritage Site, is the second-most visited of Mexico's archaeological sites. The archaeological site draws many visitors from the popular tourist resort of Cancún, who make a day trip on tour buses. 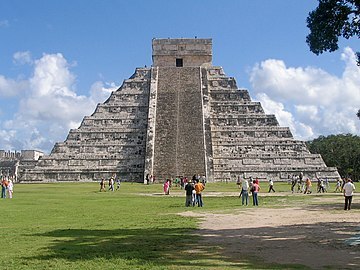 In 2007, Chichen Itza's El Castillo was named one of the New Seven Wonders of the World after a worldwide vote. 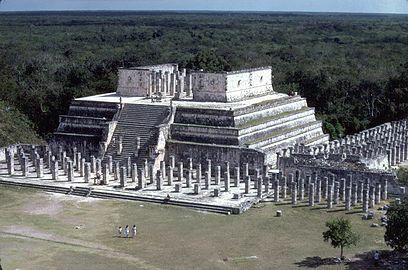 Despite the fact that the vote was sponsored by a commercial enterprise, and that its methodology was criticized, the vote was embraced by government and tourism officials in Mexico who projected that as a result of the publicity the number of tourists to Chichen would double by 2012. [nb 8] The ensuing publicity re-ignited debate in Mexico over the ownership of the site, which culminated on 29 March 2010 when the state of Yucatán purchased the land upon which the most recognized monuments rest from owner Hans Juergen Thies Barbachano. INAH, which manages the site, has closed a number of monuments to public access. While visitors can walk around them, they can no longer climb them or go inside their chambers. Climbing access to El Castillo was closed after a San Diego, California, woman fell to her death in 2006. ^ /tʃiːˈtʃɛn iːˈtsɑː/ chee-CHEN eet-SAH, Spanish: Chichén Itzá [tʃiˈtʃen iˈtsa], often with the emphasis reversed in English to /ˈtʃiːtʃɛn ˈiːtsə/ CHEE-chen EET-sə; from Yucatec Maya: Chiʼchʼèen Ìitshaʼ [tɕʰiʔtɕʼèːn ìːtsʰaʔ] (Barrera Vásquez et al., 1980.) "at the mouth of the well of the Itza people"
^ Uuc Yabnal becomes Uc Abnal, meaning the "Seven Abnals" or "Seven Lines of Abnal" where Abnal is a family name, according to Ralph L. Roys (Roys 1967, p.133n7). ^ For summation of this re-dating proposal, see in particular Andrews et al. 2003. ^ From Mayan languages: sakbʼe, meaning "white way/road". Plural form is sacbeob (or in modern Maya orthography, sakbʼeobʼ). ^ A popular explanation is that the objective of the game was to pass a ball through one of the rings, however in other, smaller ball courts there is no ring, only a post. ^ See Quetzil Castaneda (1996) In The Museum of Maya Culture (University of Minnesota Press) for a book length study of tourism at Chichen, including a chapter on the equinox ritual. For a 90-minute ethnographic documentary of new age spiritualism at the Equinox see Jeff Himpele and Castaneda (1997)[Incidents of Travel in Chichen Itza] (Documentary Educational Resources). ^ Figure is attributed to Francisco López Mena, director of the Consejo de Promoción Turística de México (CPTM – Council for the Promotion of Mexican Tourism). ^ a b c d e f Sharer and Traxler 2006, p.562. ^ Piña Chan 1980, 1993, p.13. ^ Osorio León 2006, p. 458. ^ a b c Osorio León 2006, p. 456. ^ a b Coggins 1992. ^ Freidel, p.6. Sharer and Traxler 2006, p.581. ^ Cobos Plama 2004, 2005, pp.539–540. ^ Cobos Palma 2004, 2005, p.540. ^ Cobos Palma 2004, 2005, pp.537–541. ^ Cobos Palma 2004, 2005, p.531. ^ Cobos Palma 2004, 2005, pp.531–533. ^ a b c Osorio León 2006, p. 457. ^ Osorio León 2006, p. 461. ^ Cobos Palama, 2004, 2005, p.541. ^ Thompson 1954, 1966, p.137. ^ Chamberlain 1948, pp.136, 138. ^ Restall 1998, pp.81, 149; Landa 1937, p.90. ^ Chamberlain 1948, pp.19–20, 64, 97, 134–135. ^ Brunhouse 1971, pp.195–196; Weeks and Hill 2006, p.111. ^ Brunhouse 1971, pp.195–196; Weeks and Hill 2006, pp.577–653. ^ a b Usborne (2007). ^ Sharer and Traxler 2006, pp.562–563. ^ Sharer and Traxler 2006, p.563. ^ Sharer and Traxler 2006, p.562. Coe 1999, pp.100, 139. ^ a b c d e f g h i Cano 2002, p. 84. ^ a b c d García Salgado 2010, p.118. ^ García Salgado 2010, pp.119, 122. ^ Phillips 2006, 2007, p.264. ^ Sharer and Traxler 2006, p.565. ^ a b Willard 1941. ^ a b Diario de Yucatan, 3 March 2006. ^ García Salgado 2010, pp.121–122. ^ Kurjack et al. 1991, p.150. ^ a b c d Piña Chan 1980, 1993, p.42. ^ Piña Chan 1980, 1993, p.44. ^ a b c Cano 2002, p. 83. ^ Cirerol Sansores 1948, pp.94–96. ^ a b c Cano 2002, p. 85. ^ Cano 2002, p. 87. ^ Osorio León 2006, p. 460. ^ Voss and Kremer 2000. ^ "Yucatan cultural attractions are poised to break annual visitors record". The Yucatan Times. 17 October 2017. Retrieved 18 January 2019. ^ Palmquist and Kailbourn 2000, p.252. ^ Ball, 14 December 2004. ^ EFE, 29 June 2007. ^ Boffil Gómez, 30 March 2010. Andrews, Anthony P.; E. Wyllys Andrews V.; Fernando Robles Castellanos (January 2003). "The Northern Maya Collapse and its Aftermath". Ancient Mesoamerica. New York: Cambridge University Press. 14 (1): 151–156. doi:10.1017/S095653610314103X. ISSN 0956-5361. OCLC 88518111. Anda Alanís; Guillermo de (2007). "Sacrifice and Ritual Body Mutilation in Postclassical Maya Society: Taphonomy of the Human Remains from Chichén Itzá's Cenote Sagrado". In Vera Tiesler; Andrea Cucina (eds.). New Perspectives on Human Sacrifice and Ritual Body Treatments in Ancient Maya Society. Interdisciplinary Contributions to Archaeology. Michael Jochim (series ed.). New York: Springer Verlag. pp. 190–208. ISBN 978-0-387-48871-4. ISSN 1568-2722. OCLC 81452956. Aveni, Anthony F. (1997). Stairways to the Stars: Skywatching in Three Great Ancient Cultures. New York: John Wiley & Sons. ISBN 0-471-15942-5. OCLC 35559005. Ball, Philip (14 December 2004). "News: Mystery of 'chirping' pyramid decoded". nature.com. Nature Publishing Group. doi:10.1038/news041213-5. Retrieved 14 December 2011. Beyer, Hermann (1937). Studies on the Inscriptions of Chichen Itza (PDF). Contributions to American Archaeology, No.21. Washington D.C.: Carnegie Institution of Washington. OCLC 3143732. Archived from the original (PDF Reprint) on 11 March 2003. Retrieved 22 November 2007. Boffil Gómez; Luis A. (30 March 2007). "Yucatán compra 80 has en la zona de Chichén Itzá" [Yucatán buys 80 hectares in the Chichen Itza zone]. La Jornada (in Spanish). Mexico City: DEMOS, Desarollo de Medios, S.A. de C.V. Retrieved 14 December 2011. Boot, Erik (2005). Continuity and Change in Text and Image at Chichen Itza, Yucatan, Mexico: A Study of the Inscriptions, Iconography, and Architecture at a Late Classic to Early Postclassic Maya Site. CNWS Publications no. 135. Leiden, The Netherlands: CNWS Publications. ISBN 90-5789-100-X. OCLC 60520421. Breglia, Lisa (2006). Monumental Ambivalence: The Politics of Heritage. Austin: University of Texas Press. ISBN 978-0-292-71427-4. OCLC 68416845. Brunhouse, Robert (1971). Sylvanus Morley and the World of the Ancient Mayas. Norman, Oklahoma: University of Oklahoma Press. ISBN 978-0-8061-0961-9. OCLC 208428. Cano, Olga (January – February 2002). "Chichén Itzá, Yucatán (Guía de viajeros)". Arqueología Mexicana (in Spanish). Mexico: Editorial Raíces. IX (53): 80–87. ISSN 0188-8218. OCLC 29789840. Castañeda, Quetzil E. (1996). In the Museum of Maya Culture: Touring Chichén Itzá. Minneapolis: University of Minnesota Press. ISBN 0-8166-2672-3. OCLC 34191010. Castañeda, Quetzil E. (May 2005). "On the Tourism Wars of Yucatán: Tíichʼ, the Maya Presentation of Heritage". Anthropology News. Arlington, VA: American Anthropological Association. 46 (5): 8–9. doi:10.1525/an.2005.46.5.8.2. ISSN 1541-6151. OCLC 42453678. Archived from the original (Reprinted online as "Tourism "Wars" in the Yucatán", AN Commentaries) on 11 October 2007. Retrieved 22 November 2007. Chamberlain, Robert S. (1948). 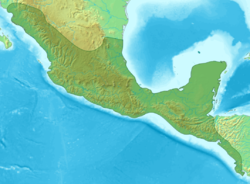 The Conquest and Colonization of Yucatán 1517–1550. Washington D.C.: Carnegie Institution of Washington. OCLC 42251506. Charnay, Désiré (1886). "Reis naar Yucatán". De Aarde en haar Volken, 1886 (in Dutch). Haarlem, Netherlands: Kruseman & Tjeenk Willink. OCLC 12339106. Project Gutenberg etext reproduction [#13346]. Retrieved 23 November 2007. Charnay, Désiré (1887). Ancient Cities of the New World: Being Voyages and Explorations in Mexico and Central America from 1857–1882. J. Gonino and Hellen S. Conant (trans.). New York: Harper & Brothers. OCLC 2364125. Chavez, Rene; et al. (2015). A Special ERT-3D Array Carried Out to Investigate the Subsoil of the Pyramid El Castillo, Chichen Itza, Mexico (PDF). Tejero A., Cifuentes-Nava G. and Hernandez-Quintero E. Turin, Italy: Near Surface Geoscience 2015 - 21st European Meeting of Environmental and Engineering Geophysics. Retrieved 5 February 2018. Cirerol Sansores, Manuel (1948). "Chi Cheen Itsa": Archaeological Paradise of America. Mérida, Mexico: Talleres Graficos del Sudeste. OCLC 18029834. Clendinnen, Inga (2003). Ambivalent Conquests: Maya and Spaniard in Yucatán, 1517–1570. New York: Cambridge University Press. ISBN 0-521-37981-4. OCLC 50868309. Cobos Palma, Rafael (2005) . "Chichén Itzá: Settlement and Hegemony During the Terminal Classic Period". In Arthur A. Demarest; Prudence M. Rice; Don S. Rice (eds.). The Terminal Classic in the Maya Lowlands: Collapse, Transition, and Transformation (paperback ed.). Boulder, Colorado: University Press of Colorado. pp. 517–544. ISBN 0-87081-822-8. OCLC 61719499. Coe, Michael D. (1987). The Maya (4th edition, revised ed.). London and New York: Thames & Hudson. ISBN 0-500-27455-X. OCLC 15895415. Colas, Pierre R.; Alexander Voss (2006). 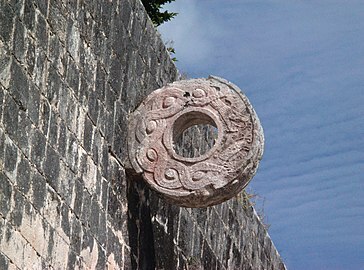 "A Game of Life and Death – The Maya Ball Game". In Nikolai Grube (ed.). Maya: Divine Kings of the Rain Forest. Eva Eggebrecht and Matthias Seidel (assistant eds.). Cologne, Germany: Könemann. pp. 186–191. ISBN 978-3-8331-1957-6. OCLC 71165439. Demarest, Arthur (2004). Ancient Maya: The Rise and Fall of a Rainforest Civilization. Case Studies in Early Societies, No. 3. Cambridge: Cambridge University Press. ISBN 0-521-59224-0. OCLC 51438896. Diario de Yucatán (3 March 2006). "Fin a una exención para los mexicanos: Pagarán el día del equinoccio en la zona arqueológica" [End to an exemption for Mexicans: They will have to pay entry to the archaeological zone on the equinox]. Diario de Yucatán (in Spanish). Mérida, Yucatán: Compañía Tipográfica Yucateca, S.A. de C.V. OCLC 29098719. EFE (29 June 2007). "Chichén Itzá podría duplicar visitantes en 5 años si es declarada maravilla" [Chichen Itza could double visitors in 5 years if declared wonder] (in Spanish). Madrid, Spain. Agencia EFE, S.A.
Freidel, David. "Yaxuna Archaeological Survey: A Report of the 1988 Field Season" (PDF). Foundation for the Advancement of Mesoamerican Studies. Retrieved 12 December 2011. Fry, Steven M. (2009). "The Casa Colorada Ball Court: INAH Turns Mounds into Monuments". www.americanegypt.com. Mystery Lane Press. Retrieved 14 December 2011. García-Salgado, Tomás (2010). "The Sunlight Effect of the Kukulcán Pyramid or The History of a Line" (PDF). Nexus Network Journal. Retrieved 27 July 2011. Gobierno del Estado de Yucatán (2007). "Municipios de Yucatán: Tinum" (in Spanish). Mérida, Yucatán: Gobierno del Estado de Yucatán. Archived from the original on 3 January 2012. Retrieved 30 January 2012. Himpele, Jeffrey D. and Quetzil E. Castañeda (Filmmakers and Producers) (1997). Incidents of Travel in Chichén Itzá: A Visual Ethnography (Documentary (VHS and DVD)). Watertown, MA: Documentary Educational Resources. OCLC 38165182. Koch, Peter O. (2006). The Aztecs, the Conquistadors, and the Making of Mexican Culture. Jefferson, North Carolina: McFarland & Co. ISBN 0-7864-2252-1. OCLC 61362780. Kowalski, Jeff K. (1985). "Painted architecture in the Northern Maya Area". Painted Architecture and Polychrome Monumental Sculpture in Mesoamerica: A Symposium at Dumbarton Oaks, 10th to 11th October 1981. Jefferson, North Carolina: Dumbarton Oaks Research Library and Collection. pp. 51–82. ISBN 0-884-02142-4. OCLC 611687168. Landa, Diego de (1937). William Gates (trans.) (ed.). Yucatan Before and After the Conquest. Baltimore, Maryland: The Maya Society. OCLC 253690044. Luxton, Richard N. (trans.) (1996). The book of Chumayel : the counsel book of the Yucatec Maya, 1539–1638. Walnut Creek, California: Aegean Park Press. ISBN 0-89412-244-4. OCLC 33849348. Madeira, Percy (1931). An Aerial Expedition to Central America (Reprint ed.). Philadelphia: University of Pennsylvania. OCLC 13437135. Masson, Marilyn (2006). "The Dynamics of Maturing Statehood in Postclassic Maya Civilization". In Nikolai Grube (ed.). Maya: Divine Kings of the Rain Forest. Eva Eggebrecht and Matthias Seidel (assistant eds.). Cologne, Germany: Könemann. pp. 340–353. ISBN 978-3-8331-1957-6. OCLC 71165439. Morley, Sylvanus Griswold (1913). W. H. R. Rivers; A. E. Jenks; S. G. Morley (eds.). Archaeological Research at the Ruins of Chichen Itza, Yucatan. Reports upon the Present Condition and Future Needs of the Science of Anthropology. Washington, D.C.: Carnegie Institution of Washington. OCLC 562310877. Morris, Earl H. (1931). The Temple of the Warriors. New York: Charles Scribner's Sons. Osorio León, José (2006). "La presencia del Clásico Tardío en Chichen Itza (600–800/830 DC)". In Laporte, J.P.; Arroyo, B.; Mejía, H. (eds.). XIX Simposio de Investigaciones Arqueológicas en Guatemala, 2005 (PDF) (in Spanish). Guatemala City, Guatemala: Museo Nacional de Arqueología y Etnología. pp. 455–462. Retrieved 15 December 2011. Palmquist, Peter E.; Thomas R. Kailbourn (2000). Pioneer Photographers of the Far West: A Biographical Dictionary, 1840–1865. Stanford, CA: Stanford University Press. ISBN 0-8047-3883-1. OCLC 44089346. Pérez de Lara, Jorge (n.d.). "A Tour of Chichen Itza with a Brief History of the Site and its Archaeology". Mesoweb. Retrieved 23 November 2007. Phillips, Charles (2007) . The Complete Illustrated History of the Aztecs & Maya: The definitive chronicle of the ancient peoples of Central America & Mexico - including the Aztec, Maya, Olmec, Mixtec, Toltec & Zapotec. London: Anness Publishing Ltd. ISBN 1-84681-197-X. OCLC 642211652. Piña Chan, Román (1993) . Chichén Itzá: La ciudad de los brujos del agua (in Spanish). Mexico City: Fondo de Cultura Económica. ISBN 968-16-0289-7. OCLC 7947748. Restall, Matthew (1998). Maya Conquistador. Boston, Massachusetts: Beacon Press. ISBN 978-0-8070-5506-9. OCLC 38746810. Roys, Ralph L. (trans.) (1967). The Book of Chilam Balam of Chumayel. Norman, Oklahoma: University of Oklahoma Press. OCLC 224990. Ruiz, Francisco Pérez. "Walled Compounds: An Interpretation of the Defensive System at Chichen Itza, Yucatan" (PDF). Foundation for the Advancement of Mesoamerican Studies. Retrieved 7 June 2015. Schele, Linda; David Freidel (1990). A Forest of Kings: The Untold Story of the Ancient Maya (Reprint ed.). New York: Harper Perennial. ISBN 0-688-11204-8. OCLC 145324300. Schmidt, Peter J. (2007). "Birds, Ceramics, and Cacao: New Excavations at Chichén Itzá, Yucatan". In Jeff Karl Kowalski; Cynthia Kristan-Graham (eds.). Twin Tollans: Chichén Itzá, Tula, and the Epiclassic to Early Postclassic Mesoamerican World. Washington D.C.: Dumbarton Oaks Research Library & Collection : Distributed by Harvard University Press. ISBN 0-88402-323-0. OCLC 71243931. SECTUR (2006). Compendio Estadístico del Turismo en México 2006. Mexico City: Secretaría de Turismo (SECTUR). SECTUR (7 July 2007). "Boletín 069: Declaran a Chichén Itzá Nueva Maravilla del Mundo Moderno" (in Spanish). Mexico City: Secretaría de Turismo. Archived from the original on 17 March 2012. Retrieved 16 December 2011. Thompson, J. Eric S. (1966) . The Rise and Fall of Maya Civilization. Norman, Oklahoma: University of Oklahoma Press. ISBN 0-8061-0301-9. OCLC 6611739. Tozzer, Alfred Marston; Glover Morrill Allen (1910). Animal figures in the Maya codices. 4 (Papers of the Peabody Museum of American Archaeology and Ethnology, Harvard University ed.). Cambridge, Massachusetts: The Museum. OCLC 2199473. Usborne, David (7 November 2007). "Mexican standoff: the battle of Chichen Itza". The Independent. Independent News & Media. Retrieved 9 November 2007. Voss, Alexander W.; H. Juergen Kremer (2000). Pierre Robert Colas (ed.). Kʼakʼ-u-pakal, Hun-pik-tokʼ and the Kokom: The Political Organization of Chichén Itzá (PDF). Markt Schwaben, Germany: Verlag Anton Saurwein. ISBN 3-931419-04-5. OCLC 47871840. Weeks, John M.; Jane A. Hill (2006). The Carnegie Maya: the Carnegie Institution of Washington Maya Research Program, 1913–1957. Boulder, Colorado: University Press of Colorado. ISBN 978-0-87081-833-2. OCLC 470645719. Willard, T.A. (1941). Kukulcan, the Bearded Conqueror : New Mayan Discoveries. Hollywood, California: Murray and Gee. OCLC 3491500. Holmes, William H. (1895). Archeological Studies Among the Ancient Cities of Mexico. Chicago: Field Columbian Museum. OCLC 906592292. Spinden, Herbert J. (1913). A Study of Maya Art, Its Subject Matter and Historical Development. Cambridge, Mass. : The Museum. OCLC 1013513. Stephens, John L. (1843). Incidents of Travel in Yucatan. New York: Harper and Brothers. OCLC 656761248. Wren, Linnea, et al., eds. Landscapes of the Itza: Archeology and Art History at Chichen Itza and Neighboring Sites. Gainesville: University of Florida Press 2018. Wikimedia Commons has media related to Chichén Itzá. 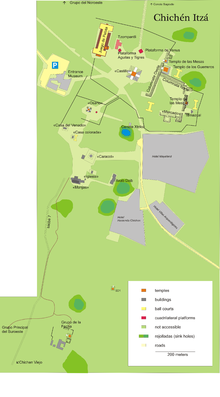 Wikivoyage has a travel guide for Chichén Itzá. Wikisource has the text of the 1905 New International Encyclopedia article Chichén-Itzá.